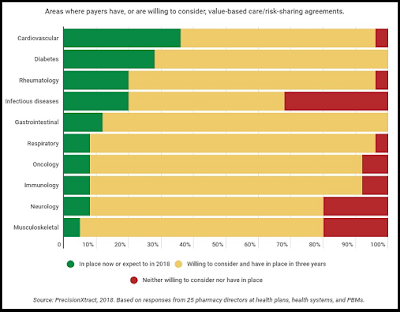 Value-based or outcomes-based contracting between manufacturers and payers, which links reimbursement to patient outcomes, is not only helping reassure payers with a promise of balancing access and affordability, it’s also helping manufacturers accelerate coverage decisions. Patisiran, developed by Alnylam, is a medication for the treatment of polyneuropathy in people with hereditary transthyretin-mediated amyloidosis. Hereditary transthyretin-mediated amyloidosis is a fatal rare disease that is estimated to affect 50,000 people worldwide. Alnylam’s president, Barry Greene, told investors in November that, although Patisiran’s initial sales fell below analyst expectations, he anticipates having about 70% of commercial patients covered under VBCs, which can shave about $100,000 off the list price if the drug’s performance doesn’t match its clinical trial results. Most self-insured employers believe "they are all set" when it comes to their PBM service agreement. Many of you believe, naively, that being represented by a big brokerage house or consulting firm protects you from being fleeced. It is my experience that in fact the opposite is often true. Don't believe me? Look to your PBM contract and determine if outcomes-based rebates are being returned to your company. If you're one of the more sophisticated purchasers who are receiving these rebates, what is your share? You'll likely discover outcomes-based rebates are largely being retained (not passed-through) by the non-fiduciary PBM as a service fee. Last word on outcomes-based rebates, where there is smoke there is fire. Once solely the province of a limited number of disease states and less expensive medicines, outcomes-based contracting for drugs is poised to expand. It’s growing beyond chronic care areas and into specialty diseases, and the agreements are now being negotiated earlier so they can be offered as soon as brands arrive on market. This trend is being accelerated by the skyrocketing cost of newer medicines themselves, many of which promise to treat patients and transform lives in just one dose, shot, or transfusion.